A committee of the House of Representatives, appointed to inquire into the state of the Treasury Department, is charged, among other things, to inquire into the authorities from the President to the Secretary of the Treasury respecting the making and disbursement of the loans made under the acts of the 4th and 12th August, 1790. You will perceive by the inclosed copy of a paper of this date, delivered to the committee, the opinion I entertain of the proper limits of a legislative inquiry on that subject. But, in the event of a determination that the inquiry should be general, it becomes proper to fix with the President the true view of facts. The real course of the transaction has been this. Before I made the disposition of any loan, I regularly communicated to the President my ideas of the proper disposition, designating how much it would be expected to pay to France—how much to draw to the United States—and always received his sanction for what was adopted and afterwards carried into execution. The communication and the sanction were verbal whenever the President was at the seat of government. In a case of absence, they were in writing. This will appear from my letters of the 10th and 14th April, 1791, and from the President’s answer of the 7th of May, following. My letters of the 29th July and 22d September, 1791, and of the 27th August and 22d September, 1792, contain a further illustration of the general spirit of proceeding in the case, in regard to the consultation of the President. The sanctions of the President were sometimes expressly, and always, as I conceived, in their spirit, founded in a material degree in the confidence that the measures proposed were guided by a just estimate on my part of circumstances which, from situation, must have been best known to me, and that they would be always in conformity to the law. With the most perfect respect, etc. 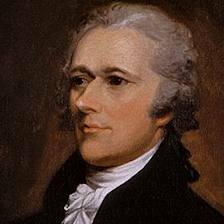 Posting the entire Works of Alexander Hamilton is a project of Steven Montgomery. I’m posting these as a way to read and digest the works of Alexander Hamilton. The reader could profit by following along daily.